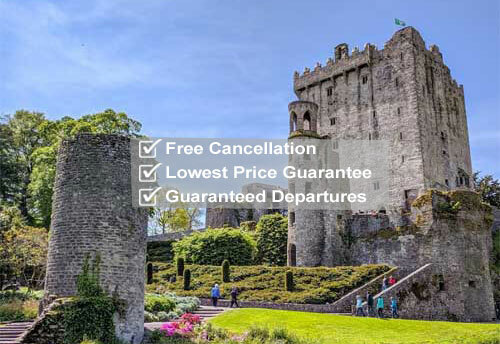 Your bus tour departs from your ship in Cobh (or sometimes Ringaskiddy) first heading for Blarney Castle where you will have up to 2.5 hours free time to Kiss the legendary Blarney Stone and explore the amazing gardens surrounding the Castle. After our visit to Blarney we will enjoy a panoramic driving tour through Cork city centre taking in famous landmarks such as The Shandon Bells, The English Market, St. Finbarre's Cathedral and University College Cork. During this section of our tour you will enthralled by stories of Vikings, Normans and of course modern day locals. After our Cork city tour, we will head back to your ship where you will immerse yourself in the rich maritme history of Cobh while taking in some stunning harbour scenery and discover why Cobh is forever linked to the ill fated Titanic. You will also learn of the fascinating history of Lusitania mass graves, The Potato Famine and Ireland's mass emigration.